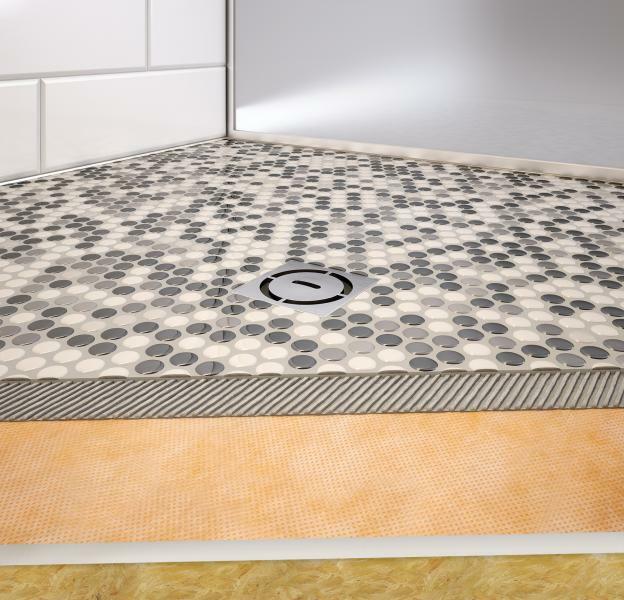 Because custom tiled showers continue to grow in popularity, Schluter-Systems has introduced 16 new prefabricated, sloped trays for showers with the Kerdi-Drain point drain and Kerdi-Line linear drain. “These additional shapes and sizes will make it much easier for homeowners and construction professionals to choose a tray that suits the size of the shower they are building,” the company says. In addition to the additional sizes available, the company’s shower trays now feature integrated Kerdi waterproofing on the top of the tray. The new shower trays for the Kerdi point drain include 38 by 60 inches, 48 by 72 inches, and 72 by 72 inches with center drain placement; 38 by 60 inches with offset drain placement; and 36 by 36 inches, 38 by 38 inches, and 48 by 48 inches with reduced-height with center drain placement. New sizes for the Kerdi-Line linear drain include 38 by 38 inches, 48 by 48 inches, and 55 by 55 inches with center drain placement; and 39 by 39 inches, 48 by 48 inches, 55 by 55 inches, 36 by 72 inches, 38 by 76 inches, and 76 by 38 inches with perimeter drain placement. The company also is introducing three reduced-thickness shower trays that help create curbless and barrier-free showers. The new shower trays feature perimeter heights of 1 inch or less to simplify the design and construction of curbless shower entries. It also will allow more people to have curbless showers installed in their homes, the company says.